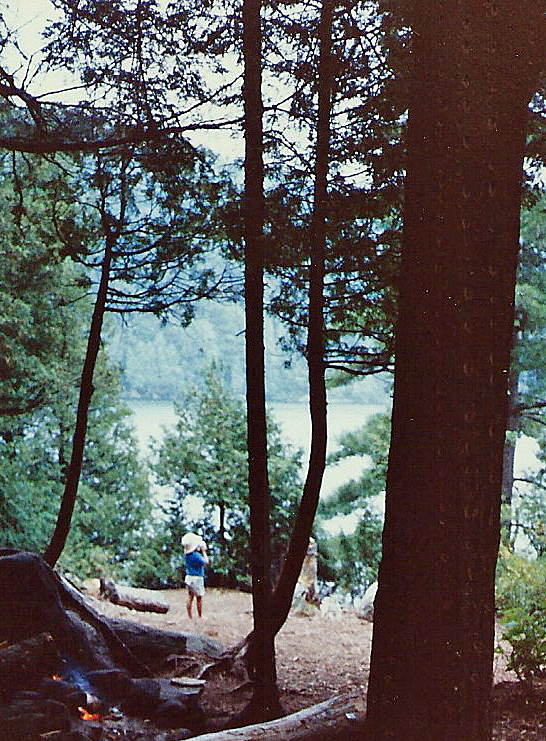 I often reminisce about our maiden trip into Algonquin Park, Ontario that September weekend in 1990. A lack of written trip notes makes it difficult to tell the story with the accuracy and color I would like. However, several scenes and events are indelibly etched into my memory and reviewing 28-year-old photographs from the trip sharpen those memories like the tuner on an old black and white TV. 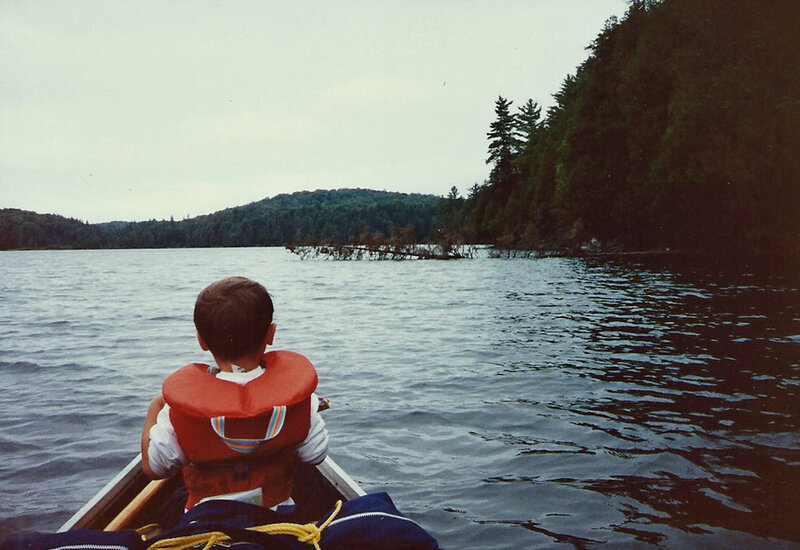 What motivated me to take our 4-year-old son on a backcountry canoe trip into the interior of Algonquin Park for a long Labor Day weekend? 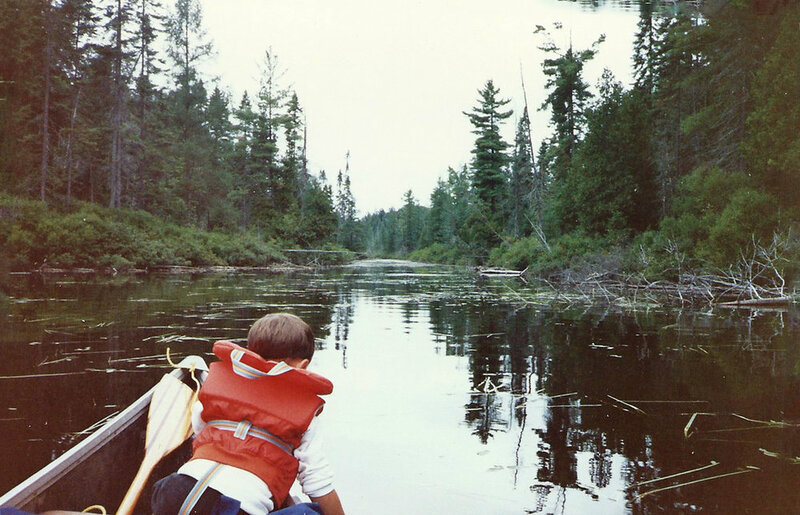 This would be the first of many canoe trips into ‘The Park’ and was the first camping trip of any significance including our first foray in a canoe. I had camped as a kid with my own family but never very far from the security of a car or building. 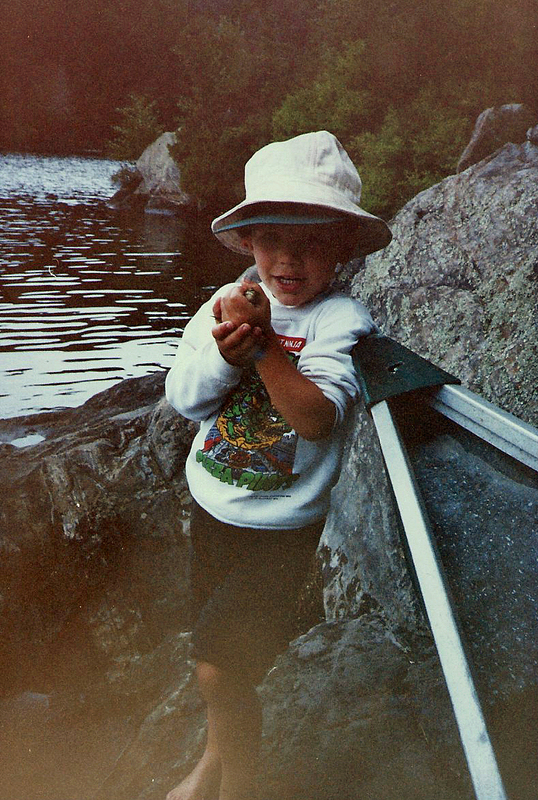 I had an honest affinity for the outdoors growing up on a 25-acre woodlot and learning to fish for Brook Trout on a natural spring-fed stream. 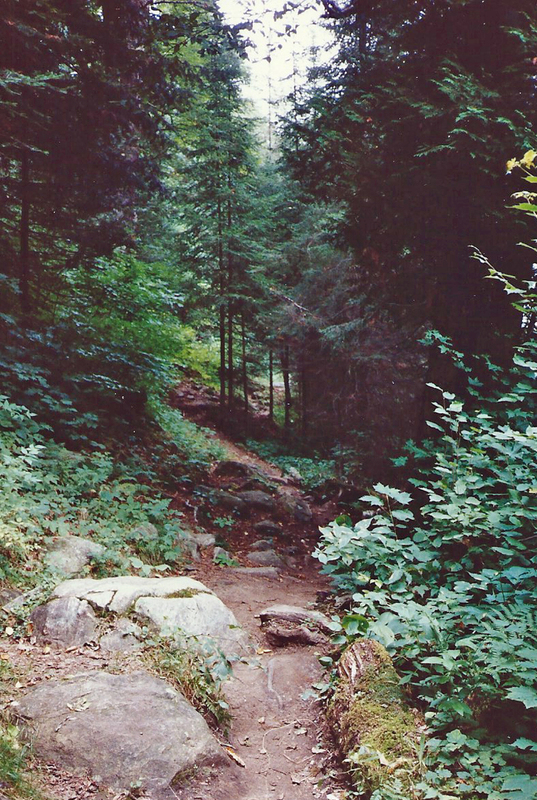 The solitude of the woods was the perfect salve for a young man with many emotional growing pains. A favorite TV program during my youth was ‘The Red Fisher Show’. I dreamed of being like Red, telling fishing tales around the woodstove at Skuttlebutt Lodge with camera footage of spectacular fishing and delicious shore lunches. The librarian in our small home town knew of my piscatorial passion and would save me expired issues of Field & Stream magazine. I would practice fishing tips learned in those magazines on our small trout stream and dream of one day venturing out on a real wilderness trip. The stories of my birthplace in northern Quebec also held a mysterious allure. It is fascinating how we develop our passions. All of these experiences played roles in developing my love for the outdoors and motivation for this maiden canoe-camping trip. May 1989, with a young family and a freshly minted Chemical Engineering degree from the University of Toronto, I started my career with DuPont Canada in Ajax, Ontario. I befriended two work colleagues who held extensive experiences canoe-tripping in Algonquin Park. Ed was an intrepid trout fisherman and his tales of The Park sparked my imagination. Ed encouraged me to plan my own trip. My memory is vague on who suggested taking my 4-year-old son, Drew, on this maiden voyage. My other colleague, also named Ed, provided much practical advice for ensuring a safe and memorable trip. The next Labor Day long weekend was chosen for the trip. We expected that the mosquito, deer fly and horse fly activity would be low in early September which was an important consideration. 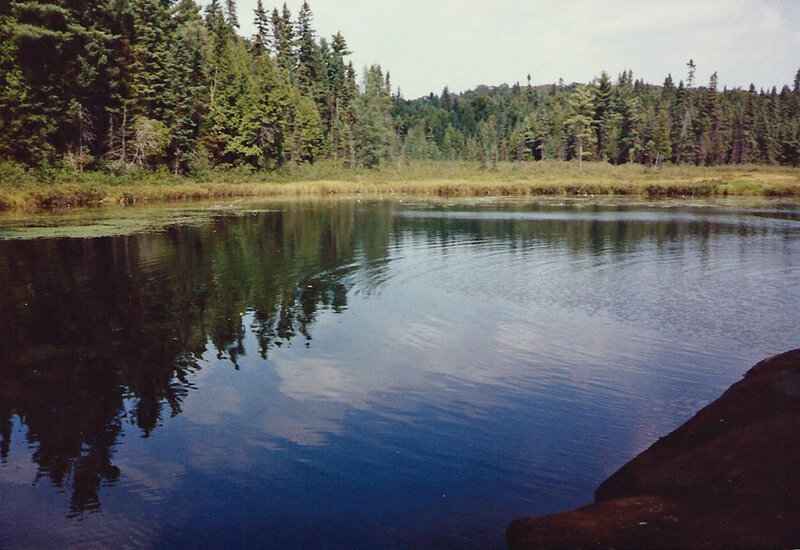 The Magnetewan Lake access point on the west side of The Park was chosen as the put-in site with Daisy Lake as the camping destination. The route seemed reasonable with 3 short portages separating Magnetewan, Hambone and Daisy Lakes. I possessed very little paddling experience and the Daisy Lake destination would avoid large open water. I was warned of the strong winds and waves that can be encountered in September and this has been proven true over the years. There was no World Wide Web or smart phones back then so research was conducted at the library and in discussions with my colleagues. I studied canoe paddling technique in a book by Bill Mason and have a vague recollection of watching one of his paddling videos on VHS. We had essentially zero disposable income to buy any fancy camping equipment so we needed to be frugal and creative in the gear planning. My supervisor, Les, graciously offered to loan us his 16-foot fiberglass canoe. It was a beast of a vessel at over 60 pounds with a straight aluminum thwart for a yoke. Several key pieces of equipment were borrowed from my father-in-law including PFDs, sleeping bags, a large canvas 4-person barn tent, a briefcase-style 2-burner Coleman stove fueled with white gas (naptha), a Coleman propane lantern and about 25 feet of 3/8-inch yellow nylon rope from my brother-in-law. We purchased an aluminum pot set and coffee percolator at Canadian Tire and a small wooden paddle for Drew. Sleeping pads were conspicuously missing from our gear list. From the house we sequestered Corel coffee cups, bowls and plates, steel utensils, a carpenter’s hand saw, a soft-sided Molson Canadian cooler and cut a bailer from a 1-gallon plastic water jug. The gear was stuffed into large canvas duffels including an old Boston Bruins hockey bag. It would become apparent that I grossly underestimated the difficulty carrying this stuff across several ‘short’ portages. Cotton jeans, socks and shirts with leather sneakers formed our camp clothing. Not the ideal outerwear for a backcountry excursion. Meals were planned but I have little recollection of what we actually ate beyond granola bars and fruit roll-ups. Our adventure began with a drive up Highway 11 to Kearney, Ontario followed by 40 minutes navigating a rocky logging road to the access parking lot. Rolling over washboards and around random boulders challenged the fully loaded 1985 Renault Alliance. The anticipation and excitement peaked as we pulled into the parking lot and glimpsed Magnetewan Lake for the first time. This feeling is relived every time I begin a new adventure into The Park. It is truly a magical place. We unloaded canoe and gear and were soon paddling across the first lake. Handling the canoe turned out to be much easier than anticipated perhaps because of the preparation done with the Bill Mason book and video. The portages proved to be a bigger challenge and confirmed I had grossly underestimated the task of carrying everything across the hilly and mucky paths. We had too much gear in too many pieces with inadequate packs and that beast of a canoe with metal thwart and over 60 pounds of resin and fiberglass. Up, down, up, down, around, over and back … And young Drew struggled to deliver the paddles and bailer. Remember he was a 4-year-old. I eventually lashed the paddles and bailer together so he could drag them across the portages while encouraging him with sugary snacks. We finished the last portage, reloaded the canoe and pushed off into Daisy Lake with its wild and eerie character. Fallen and decaying trees lay all along the water’s edge Awe and wonder accompanied each stroke of wooden blade through clear and cold water. I could sense that young Drew was making his own connection to this special place. We paddled towards an island campsite which was chosen to reduce the risk of encountering bears and other wild animals. This concern has disappeared over the years with the biggest nuisance proving to be voracious mice and chipmunks. 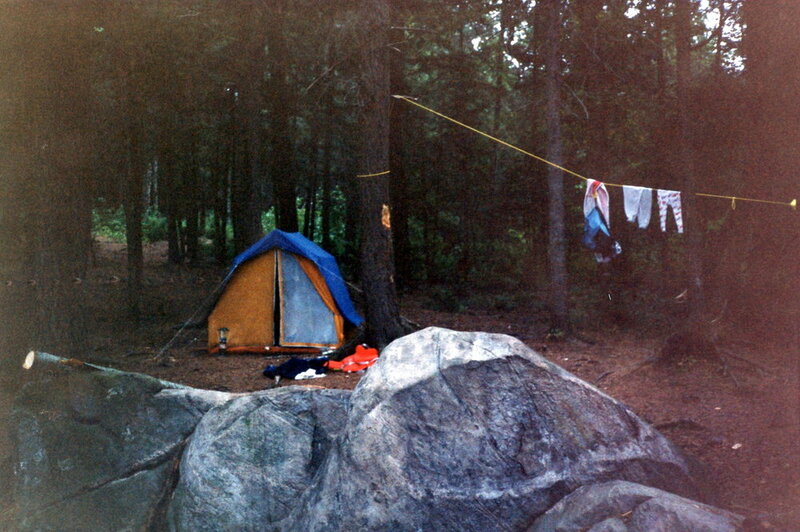 The campsite had a steep and rocky shoreline with a large fire pit and plenty of flat ground to pitch a tent. Drew ditched his shoes and started exploring while I set up camp. He was full of joy and wonder chasing and capturing multiple frogs by the shoreline and bringing specimens to me for inspection. 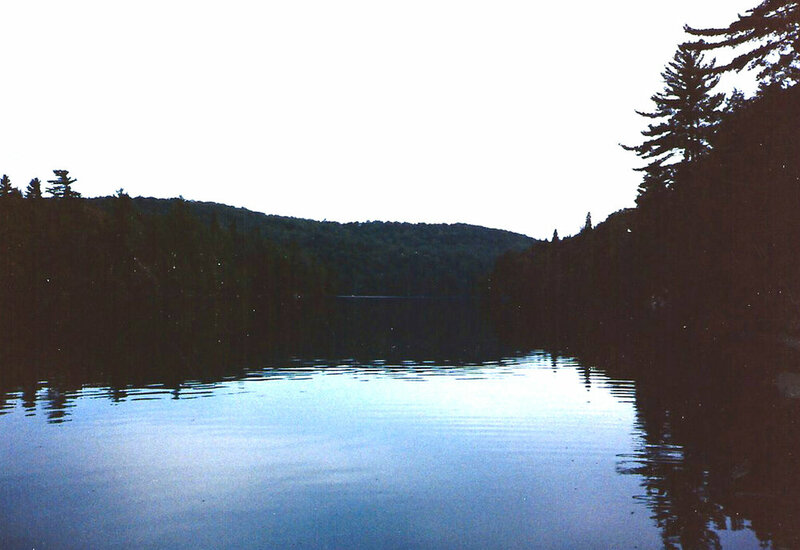 We took a dip in the lake after setting camp and discovered why Algonquin lakes are such excellent trout habitat. Somehow in all of the planning and discussion we had missed the instructions on where to do our business. Campsites in Algonquin Park have roofless outhouses or ‘thunder boxes’ for going number two. Unaware that a thunder box was a short walk back into the woods, we dug small cat holes and learned to squat and relieve ourselves like some distant ancestors. The September evening brought cold Algonquin Highland air and laying on the hard ground without sleeping pads exacerbated our attempts at sleep. We huddled together in our sleeping bags and made the best of it. The next day was dedicated to playing and exploring Daisy Lake. We paddled up the lake to the mouth of the Petawawa River and ventured over log jams and a large beaver dam. We returned to camp as the sun started to set. The carpenter’s saw proved to be a poor tool for cutting firewood but we still managed to enjoy an evening campfire. The next day we broke camp, packed the canoe and began the challenging trek back to the parking lot and our car. This maiden adventure quickly became part of our family lore. 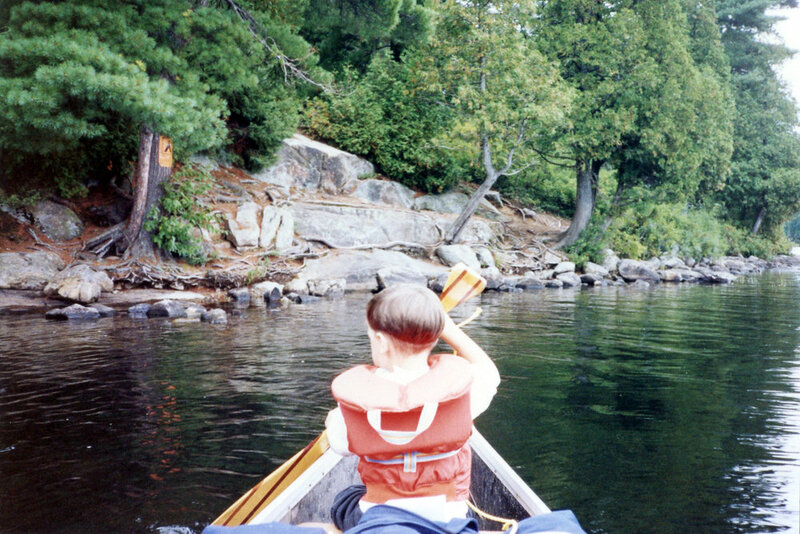 My wife reminds me of the initial comments I made upon returning, “Kristine, do you realize a 4-year-old does nothing for them self?” The trip was also the genesis for many years of camping and canoeing together as a family in Algonquin Park and a special shared bond with my son and the outdoors. He likes to warn others to, “beware of allowing dad to plan the itinerary”. Over the years our family acquired gear, honed skills and created many precious memories in spring, summer and fall trips to this special place. Sunset paddle back to camp. As I age, the details fade but the wonder and awe remain. The difficult and challenging experiences leave the deepest and most meaningful memories which is a common theme with my backcountry adventures. They are like the mile markers and anchors of life. Challenges develop spiritual and emotional character. And all of the planning and preparation gets you only so far. Eventually we must overcome our fear and doubt and just go for it. It is the experience itself that teaches and shapes us. The decisions and actions we take today shape our lives in the future and form the memories and character that we carry with us in this journey called life.